Gender: Ceronie is a female. Strength: Ceronie is strong and persistent, she wont give up until she gets what she wants. She loves her friends and is a great fighter. Weakness: Her strong points are weighed up by her weaknesses, she is cautious around new wolves, she's irresponsible and in most cases she just wants to have fun. She is VERY playful. 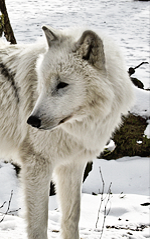 Pelt Color: The base of Ceronie's pelt is pure, pure snow white. Markings: Her markings consist of dust grey and silver strands of fur found on her forehead and along her back down to the tip of her tail. Personality: Irresponsible, very playful, full of affection, happy, curious and excited. Other: Her fur is quite short except for on her tail which is normal length, even though it becomes slightly longer in the winter it doesn't have much insulation. She is also pretty small compared to other female wolves.